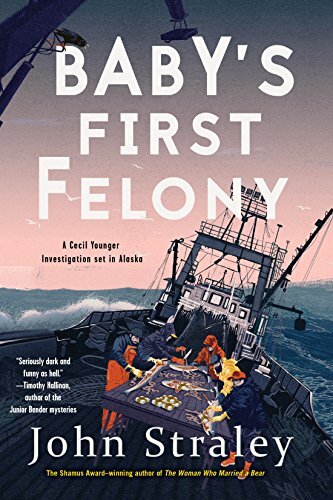 Cecil Younger works as a criminal defense investigator at the Public Defender Agency in Sitka, Alaska. He is the child of alcoholic parents, and he himself is an alcoholic who lost his driving privileges. Most of his cases involve down-and-outers mixed up in drugs or alcohol or domestic abuse. It's been suggested that Cecil's upbringing may have influenced his decision to go into this profession. He's married to mellow Jane Marie, and is the father of a rebellious, disrespectful, sassy mouth 13-year-old daughter, Blossom. By all accounts, Cecil is a good-hearted guy. He's offered to take in a friend of Blossom's whose home life is less than ideal, and he's already sharing his home with his own friend Todd who is afflicted with autism. Todd is learning to tell jokes as part of his humor therapy. Here's a sample: "A little boy was sitting on the curb in town eating a big handful of chocolate bars, one after another, and an old man comes up to him and says, 'You know, young man, you really shouldn't eat so much chocolate. It's not good for you,' and the little boy says, 'I don't know, my grandpa lived to be one hundred and three.' The old man said, 'Oh, I'm sorry, did your grandpa eat a lot of chocolate?' and the little boy said, 'No, but he learned to mind his own . . . business." The title of the book is based on a humorous, fictitious self-help booklet for law breakers written by the public defender in the Sitka Public Defender Agency. It includes common sense tips like: "When talking on the jail phone, Pig Latin is not an unbreakable code." This rambling story opens when Cecil is assigned to a missing girl case. Due to his involvement in the investigation, Blossom goes missing, too. Cecil goes out into the mean streets of Sitka searching for them both. Early on, he unwittingly comes into possession of a bag full of drug money and a note with instructions to kill someone, and he can't seem to find a way to safely dispose of it. With a missing daughter, a bag of unwanted drug money and an incriminating note, things can only get worse for him and they do. Later, Cecil, a known alcoholic, is coerced into taking a drink. It doesn't end there and it doesn't end well. Author John Straley tells the story in the form of an allocution. Chances are only a lawyer, or possibly a criminal, or someone else familiar with the criminal court system will know what that means. An allocution is a formal statement made to the court by a defendant who has been found guilty. It allows the defendant to explain in detail the reasons for the actions that led to the arrest, and provides an opportunity to request leniency. The story itself is an interesting if gritty tale peopled with colorful, compelling characters. Staley's descriptions of Sitka and environs are so on point—the buildings, the streets, the geography, the weather—that readers are made to feel part of the community. Creating a you-are-there feeling the way they do in movies is not so easy to accomplish in a book, but it's one of Straley's strong points. But all this excellence in writing is undermined by the framework in which he has chosen to tell the story. It's one long, eye-crossing narrative with no chapter breaks in the first 230 or so pages. None. Some of those pages contain almost no paragraph breaks. These structural flaws distract the reader from what's good about this book. It's sort of like jumping on a moving trolley. One is so focused on disembarking safely, they can't enjoy the ride. Only in this case, there is no place for the reader to jump off, i.e., take a break and stop reading if only to rest their eyes. Everything in life, including life itself, has a beginning, a middle, and an end. Work weeks begin and end. Seasons begin and end. Minutes, hours, weeks, and months begin and end. That's why there are clocks and calendars. Books need chapters and time breaks. They're needed for pacing and cliffhangers, and because readers are used to it and expect it. Because of those structural flaws, Baby's First Felony is not one of this award-winning author's best efforts. Despite that, Straley fans will enjoy it.